Embryo freezing is an advanced yet simple procedure to preserve surplus embryos from an IVF or ICSI cycle. If stored properly, cryopreserved embryos can be utilized for a new cycle even after 10 years as freezing renders the embryos ageless. Embryo freezing is useful for fertility couples who have had a successful IVF birth and would want to have another child a few years later. 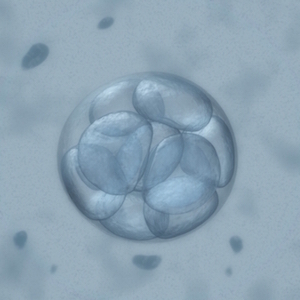 Freezing surplus embryos also safeguards against the possible failure of an ongoing IVF/ICSI cycle. Furthermore, a frozen embryo transfer (FET) is less taxing in terms of cost, effort and time as it bypasses several steps of a fresh IVF cycle. Gaudium IVF welcomes overseas patients who wish to import frozen embryos for IVF at any of the Gaudium IVF Centre locations. Indian patients are welcome to transfer embryos frozen at another clinic anywhere in India; we can help with transfer arrangements. At Gaudium IVF we use the Vitrification technique for freezing eggs, sperm and embryos. Vitrification is an ultra-rapid freezing method which eliminates potential damage to the embryo from ice crystals that form inside the embryo’s cells during the conventional slow freezing process. The vitrification process is so fast – nearly 600 times faster — that there is no time for ice crystals to form.